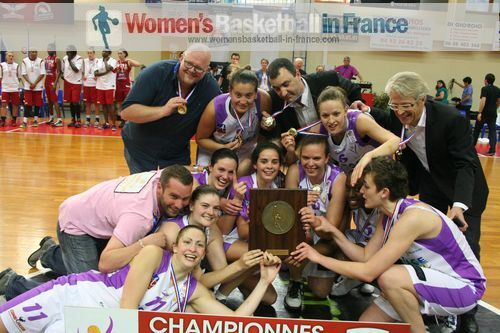 Angers (UFAB 49) are the new LF2 Champions of France after beating the Niss'Angels with some impressive shooting from beyond the arc in crunch time. Veuillez trouver en bas de page un résumé en français sur le match Angers vs. Nice, suivi d'une vidéo avec des interviews. 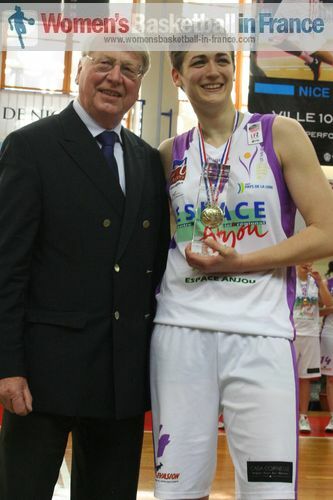 Johanna Cortinovis (in picture on the right) from Angers was the LF2 final four MVP as she was the driving force all weekend for her side to become French Champions. Her desire to win helped her team overcome any last-quarter jitters to end the final four unbeaten run of Cavigal Nice (65-55). The hosts relied too much on three-point shooting as a weapon. When the ball refused to drop at the end, the game slipped away from them. 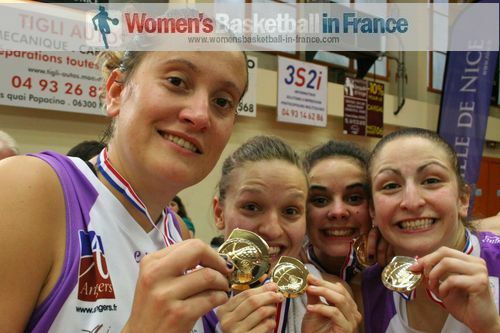 All the same Cavigal Nice are in the LFB next season while we have to wait and see if Angers can raise the finances necessary to play in the elite division. Cavigal Nice just had 2 points during the first two minutes before an exchange of the three-pointers got the crowd on their feet. After the three-balls by Aurélie Besson for Angers and Anaïs Déas for Cavigal Nice, the two teams played cat and mouse for the rest of the first quarter which resulted in 9 lead changes with Angers leading (17-16). The second quarter turned into a long distance shooting contest with both sides shooting well from the perimeter. However neither team was really able to control the game for long as the lead exchanged hands 5 times. While Nice were more successful with long shots, Angers' work on the hustle paid off with 10 trips to the foul line. Although only converting 5 of them it was enough for them to lead at the break (32-28). Elodie Decker (in picture), who is a livewire, picked up 2 more fouls to the annoyance of the home fans and soon found herself back on the bench. Despite the scrappy nature of the game Angers dug deep defensively and went in front briefly with a shot from the land of many by Julie Barennes. 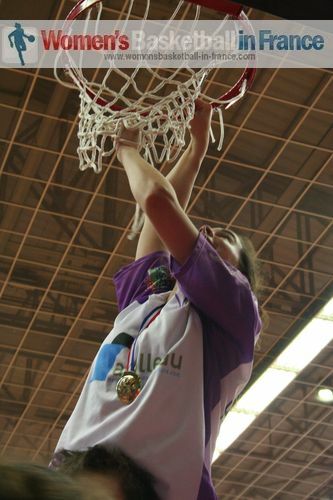 Yet the two teams were back on level terms (37-37) after Marie-Eve Paget hit a baseline three-pointer. With three minutes left to play in the quarter and the teams still locked together the Angers coaching staff decided to use a time-out to re-focus their players. In the end Cavigal Nice profited more from the time-out. The energetic Déas connected first from beyond the arc before setting up a quarter-ending buzzer play which resulted in a three-pointer by Margaux Okou-Zouzou and the lead for the hosts (43-41). The battle of three-point shots continued with Aurélie Favre hitting for Angers with the first score of the final quarter to put her side back in front (44-43). Angers started to pull away for good with Camille Aubert pulling the strings and Johanna Cortinovis hustling all over the court. 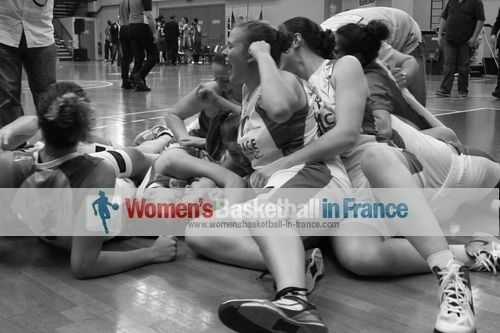 Cavigal Nice made many unnecessary fouls and with three minutes to play they trailed (45-57). 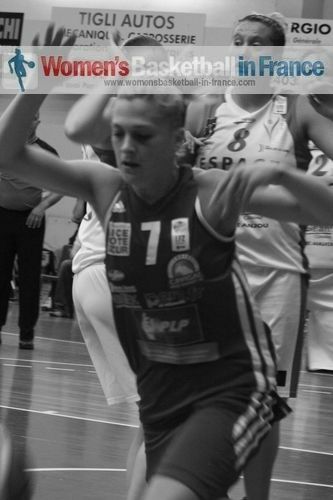 Aurélie Besson's dagger three-pointer with two minutes to play put the LF2 newcomers on their way to victory (60-49). Yet Nice always tried to come back but risked too much and failed to make the crucial shots whereas Angers remained cool to take the winner's trophy home (65-55). There are extended game highlights from the final match with scenes from the after-match celebration while the interviews with Aurélie Favre and Carine Brossais start at the 6:40 point. Dans la vidéo sur les dernières scènes du match et les célébrations, veuillez trouver les interviews avec Aurélie Favre et Carine Brossais commencent à 6:40. Coude à coude jusqu'au quatrième quart, les Nicoises avec 1 point d'avance (45-44) ont perdu face à une défense de zone et leur maladresse dans les tirs à trois points (65-55). La capitaine niçoise Jeanne Senghor-Sy n'a pas réussi à se démarquer contre Johanna Cortinovis et Julie Barennes et les tactiques du coach angelivin avec une équipe enthousiaste et concentrée ont pu faire les dégâts au quatrième quart. Pourtant Alexandra Tchangoue a tout essayé, mais quand il manque de l'adresse et de solution, rien à faire contre les Camille Aubert et Aurélie Favre. La machine d'Angers est lancé quand les joueuses infligent un 13-0 à Nice (57-45). Les Niçoises se battent, mais un tir de l'extérieur par Aurélie Besson donne le coup de grace pour un (60-49) et c'est la fin d'une fabuleuse saison et d'une zéro faute à domicile et en plus un premier revers au final four en LF2 des Niss'Angels. La défaite au final de la final four ne change pourtant rien au fait que les leaders de la saison régulière LF2 vont retrouver l'élite après une année d'absence.